Just like in people, pets need yearly dental health examinations, cleanings, and treatments to prevent dental disease. Dental disease is the number one diagnosed problem of dogs and cats under 10 years of age. It is also the most under-treated disease of dogs and cats. Approximately 60-70% of the patients that come in for an annual wellness examination will have dental disease. Less than half of those patients will have their disease treated. Why? Dogs and cats hide their dental disease until it is too late, and changes become non-reversible. We as owners often do not realize the huge impact dental disease is having on their systemic health, their lifespan, and to their quality of life. It is much easier to treat and prevent dental disease during early stages, than in later stages when the pet is showing clinical signs. 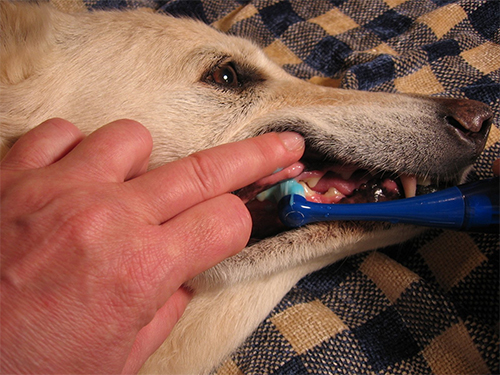 Annual dental health assessments are crucial to keeping your pet happy and healthy. A comprehensive dental health examination must be done under anesthesia. Tartar (plaque) and Gingivitis: During your pet’s annual examination your veterinarian will be able to briefly evaluate the surface of the teeth. Plaque is laid down by bacteria, so the presence of plaque is directly proportional to the level of superficial dental infection occurring in your pet’s mouth. Gingivitis is an indicator of inflammation, pain, and infection. Tartar and gingivitis on the surface may mean additional infection below the surface, and a thorough examination of each individual tooth under anesthesia is warranted. Bleeding gums: This likely indicates severe gingivitis and pain. Dropping food from the mouth, chewing on only one side of the mouth, refusal to eat: These signs could all be evidence of severe oral pain and advanced dental disease. These pets should be evaluated immediately. Facial swelling: This could be a sign of a tooth root abscess – a deep infection of the bottom of the tooth. Dental disease has been linked to a variety of health problems including microscopic changes to the kidneys, heart, and liver. It has also been associated with poor diabetic control. Poor oral hygiene has been shown to lessen the lifespan of dogs and cats by as much as 5 years. Early intervention is important! There are four stages of periodontal disease. The first two stages are REVERSIBLE and can be completely corrected with proper veterinary dental care and intervention. This includes scaling/polishing of the teeth under anesthesia and evaluating below the surface with dental x-rays. Periodontal disease stages 3 and 4 are NON-REVERSIBLE. Bone loss, infection, and gingival recession all cause severe pain and inflammation. This must be corrected immediately to prevent anorexia, weight loss, and systemic disease. Good dental care includes BOTH home oral hygiene protocols as well as yearly veterinary evaluation. Brushing teeth daily and providing dental chews can help decrease the progression of plaque and tartar formation, however it does not completely prevent it, as plaque begins forming only SIX HOURS after cleaning. Once plaque has solidified, it cannot be removed by brushing alone, and must be removed by a veterinarian. Home care also only treats the surface of the teeth. Veterinary evaluation includes dental radiographs, to assess the underlying bone and structure of each tooth, and scaling to remove any plaque that has built up. Brush those teeth! Click here to see a video of Dr. Gagne brushing her dog’s teeth. It’s not as hard as you think! Be sure to use toothpaste intended for animals. Understand what stage of periodontal disease your pet is at. Discuss with your veterinarian when your pet should have a professional dental cleaning to slow dental disease.